1 of 4 In a small bowl, combine confectioners' sugar and cocoa powder. Whisk to combine, then spread onto a shallow dish. Fill another shallow dish with 1/4 inch of water. 2 of 4 Fill a cocktail shaker with ice. 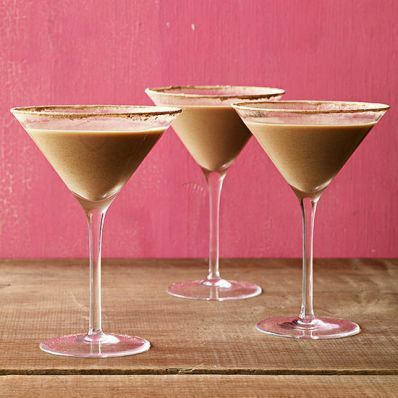 Add RumChata, creme de cacao and chocolate milk. Cover and shake until chilled. 3 of 4 Dip 2 martini glass rims in water and edge each glass in cocoa-sugar. Divide martini into prepared glasses. 4 of 4 NOTE: Horchata is a milky rice or nut-based Latin beverage. RumChata is sold in grocery and liquor stores. Per Serving: 6 g sat. fat, 63 g carb., 0 g fiber, 3 g pro., 69 mg sodium, 479 kcal cal., 9 g Fat, total, 24 mg chol.